The bottom line is, we are subject at the mercy of rapidly developing technology. As consumers of information, we peer through a multitude of invisible technological filters and lenses. Although I’ve distanced this quote from the original context in a way that might make it seem a bit more polemic than it is originally intended, I can’t help but take issue with what it proclaims. This “bottom line” – a term itself derived from the financial/corporate sector – is not as glum, or otherwise hopeless as it is proposed by Hurst. We are not at the mercy of the advancement of technology, and to claim that we are, disavows any agency we have with the gadgets and gear that we surround ourselves with on a daily basis. To make this leap, we must also refuse acknowledgment to the great hacking ethic that permeates many communities that live (or at least primarily communicate) online. To deny these communities is to deny Archangel’s very own “rise to fame” through his now infamous Super Mario Clouds cartridge hack. It is not that we are helpless to the bombardment of technology as a culture, but rather have more readily bought into the ways in which that technology packages itself as necessity in our daily lives. This process is undoubtably complicated and manipulative, but the ways in which consumers jailbreak, hack, and casually appropriate technology is evidence of our willingness to bite back. To suggest that humans are just empty vessels of consumerism enslaved to technological developments is a grave mistake, and to argue that Archangel and Bismuth are simply reacting to the demands of technology is also a shallow read of the ways in which culture responds and dynamically engages new technology in a multitude of unexpected and ingenious ways. The danger here, which I believe is part of the originally intended message, is to be unaware of the ways in which user participation and activation actually shapes the development of technology; it is a system of feedback, not a system of force-feeding. A striking example of this in the past year has been the proliferation of XBOX Kinect hacks, and how Microsoft eventually caved to the demands of its users by releasing their own Software Development Kit (even though Microsoft now quickly is trying to rewrite that history by claiming this was always their intention). This is to say that culture does not simply “peer” through the lenses of consumer technology/media. We critically contribute to the fabrication and development of those filters by means of remediation and repurposing. Culture is not simple information consumption, there is also a process of digestion. That activity is more often then not co-opted back into the corporate system – a problematic in and of itself – but requires participation on both ends, and not simply from a top-down hierarchy any longer. This emergent shift of a cultural class moving from users to makers is already underway in a variety of communities: Maker Faire, Deviant Art, /b/, are but a few. To presuppose that this activity is still “underground” or solely reserved to a select group of commercial artists is dangerously ignorant of the ways in which digital/network technology have radically reconstituted participation with, or reaction against, the supposed ceaseless march of technology. I like this. I’ve seen the Arcangel/Bismuth show and it’s not heavy on technological culture. The work that stuck with me most was a series of used books scented with celebrity perfume. Sure, this work brings up ideas of nostalgia and consumerism, but there’s no future shock here, as alluded to by the reviewer from Hyperallergic. 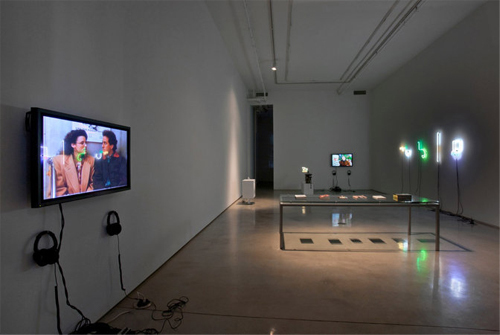 The reviewer’s misreading points to an issue that interests me: how to create a space for the technological that isn’t separate from contemporary art. Currently, the way I see out of this might come from treating anything techie – or whatever you want to call it – as like just another object humans interact with, and that reciprocally interacts with, and influences us. Art writing is friendly to object-based theory, i.e. Heidegger and Latour, so it shouldn’t be so strange to talk about artwork that’s internet-aware. There’s nothing scary about an internet we use everyday, that’s holding us down as we beg “at the mercy of rapidly developing technology.” What a cliched hyperbole! I doubt that reviewer is hovering under his bedsheets, fearing the next iPhone model.